Lovers' Day (Dia dos Namorados) is a holiday for lovers in Brazil celebrated on June 12. 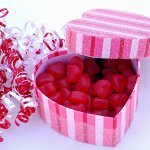 It is similar to Valentine's Day celebrated in other parts of the world on February 14. The date of June 12 was chosen because it is the eve of the feast of Saint Anthony of Padua. Saint Anthony is known in Brazil, Portugal and Spain as patron saint of marriage because there are many legends of him reconciling young couples and blessing them with happy marriage. Lovers' Day in Brazil is celebrated in a similar manner to the way that Valentine's Day is celebrated in other countries. Couples exchange gifts, such as flowers or chocolate, and have date nights. Single women sometimes perform special rituals that are believed to help find a good boyfriend or husband. Home and street decorations, carnivals, music and dancing are a typical part of the celebration. One of the reasons that Valentine's Day was replaced by Dia dos Namorados is probably that February 14 usually falls during or close to he Brazilian Carnival, and Valentine's Day would remain unnoticed amidst the Carnival celebration. So now Brazilian lovers have a separate holiday related to one of the most venerated saints in the Portuguese-speaking world.